FAQ - Printwear & Promotion LIVE! : Printwear & Promotion LIVE! Printwear & Promotion LIVE! 2020 will take place from Sunday, January 19 to Tuesday, January 21. Halls 17 & 18, NEC Birmingham. Entrance to P&P LIVE! is FREE to those involved in the garment decoration trade only. Registration for Printwear & Promotion LIVE! 2019 has now closed. Registration for P&P LIVE! 2020 will open later in the year. It really depends on where in the UK you are travelling from and how long you plan to stay for. Click HERE for more information. Is there a fee to park at the NEC venue? Yes. The cost of parking in an onsite car parking space is £16 on the day, £12 if booked in advance, which you can do HERE. There are a number of hotels in the area. More information can be found HERE. Are children allowed in the exhibition hall? Yes. Parents will be asked to complete a disclaimer form at the registration desk and each child will be issued with their own badge. This will hold the contact details of a parent in case of emergency or if a child finds themselves separated from their group at any point. If a child becomes lost in the hall, a member of the NEC team (or exhibitor) can bring them along to the Organiser’s Office where a call will be made to the number stated on their badge. We would urge parents to be vigilant and always ensure the safety of their children, especially around any working machinery at the show. A fantastic line-up of exhibitors has signed up to attend P&P LIVE! 2019. Click HERE for more information. Where can I get a floorplan? 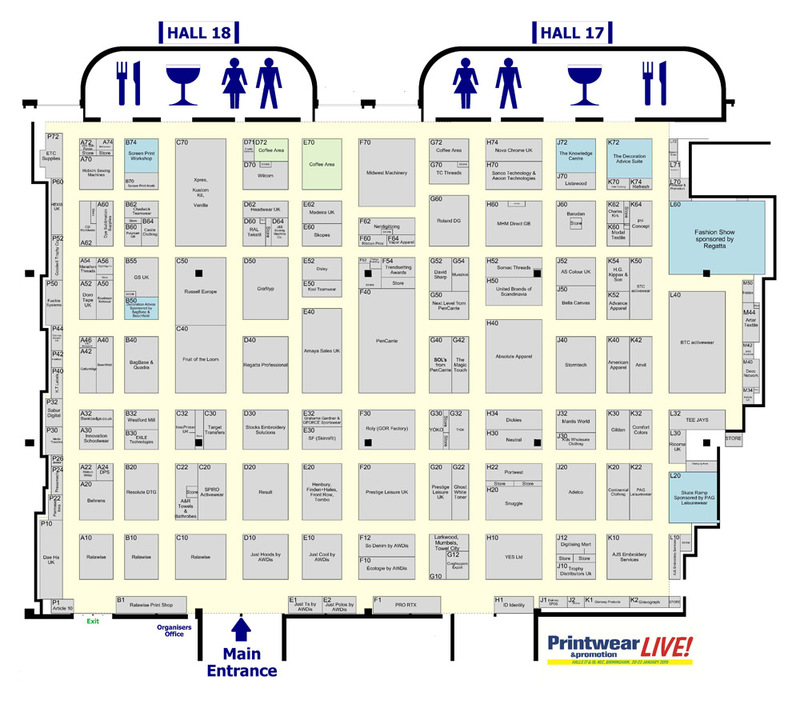 We are constantly updating the floorplan as new exhibitors sign up. You will always find the most recent copy on the home page. Is there a seminar programme? Yes. Details of the exciting and informative programme for 2020 will be updated later in the year. Speakers from across the globe will present seminars on topics including DTG printing, embroidery, marketing and so much more. Printwear & Promotion LIVE! is a one-stop-shop for printers (screen, transfer and digital), embroiderers, retailers, and promotional product distributors. Click HERE to see what past visitors have got to say. We had over 6,000 visitors at the 2019 event. Is it imperative I visit the show – will I miss out on anything if I don’t? Absolutely! No other show offers printwear professionals such a comprehensive range of product decoration equipment, new technology and blank garments, all under one roof. With the leading names already signed up, it’s the ideal opportunity to see all that is new and meet all of the major suppliers. Many of our exhibitors are using Printwear & Promotion LIVE! to announce new equipment and to show the latest printwear styles for the first time.